Tilghman Island Cottage with Big Amenities: Pool, Hot Tub, Dock, and Amazing Views!! A great little cottage with big amenities, Clearview is the answer to your getaway needs. With a swimming pool, hot tub, and views that go on and on, you can stake your claim to this spot and relax throughout your stay! Those who want to venture out can mingle with the Tilghman Island locals, watch fresh catch come in straight from the Bay, or enjoy a sunset cruise from nearby Dockside Express. Gourmet dinners at one of the local restaurants or a day trip into St. Michaels will have the foodie leaving more than satisfied. Learn about watermen and the health of the Chesapeake by visiting nearby Phillips Wharf Environmental Center. Excellent service and nice people, even third parties. This was my 7th or 8th year renting Clearview. 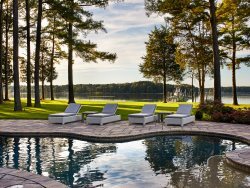 This house is in a fabulous location on the Chesapeake Bay, breath taking sunsets, you can lay at the pool during the day and see the magnificent eagles flying over your head. It is a very peaceful, serene lovely bay cottage.